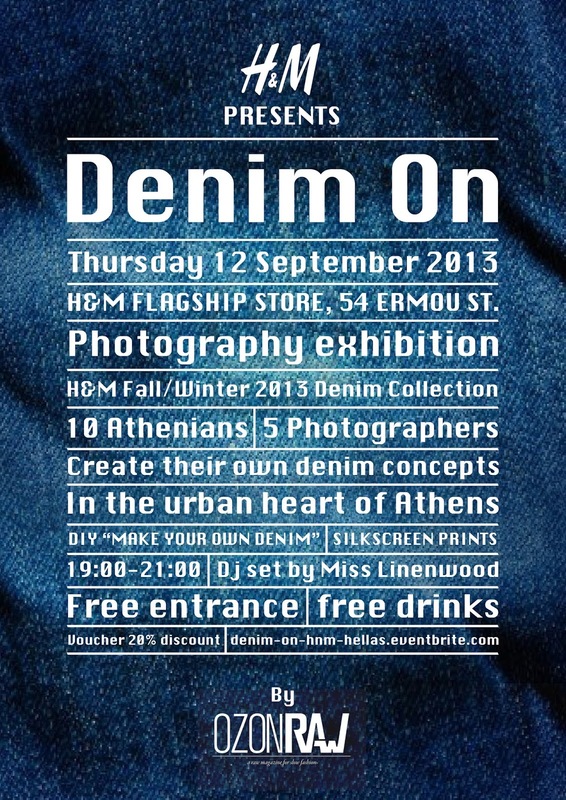 H&M Greece invites you to a party dedicated to Denim on the 12th of September at 6 p.m. at Ermou street 54 in the center of Athens! See a close up of the photo exhibition titled H & M "Denim ON" by OZON RAW starring loved ones who have excelled in their field and be inspired by their own style . Theodoris Koutsovoulos ( Dj & owner of Momix the first molecular mixology bar in Athens). Marko Rossi (chef, co-founder owner @ Gastronomic Collectiva). The photographers who worked with the creative team of OZON Raw magazine for the implementation of this project are George Malekakis, Christos Tzimas , Joanna Hadziandreou. Kostas Stavropoulos and Lambros Tyrlis . Also create your own H & M Denim with unique designs using silkscreen prints from Tind and Image Print with DIY experts in a «Make your own Denim» experience. Accept the stylish advice from sales advisors of H&M for a perfect Denim look and enjoy the musical choices by Miss Linenwood (Teardrops). Finally, participate in the photo contest «Wear your own Denim» and win a voucher of 100 €! Did you know by clicking the following link http://denim-on-hnm-hellas.eventbrite.com/ , you can print your voucher and get 20 % discount on all your purchases to Thursday, September 12 at the flagship store of H & M in Ermou 54 from 18.00 - 21.00 ! P.S. The discount is only for H&M Ermou and not in combination with any other voucher.